Under beautiful clear summer skies, we rolled into the Celtic Manor Resort unsure about what the next 3 days had in store for us. 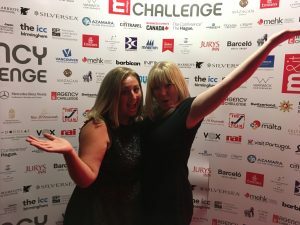 We knew we were there for fun, to meet with fellow industry professionals and to get to see some of the finest venues and suppliers our industry has to offer, but how we were going to do this, we were about to find out! 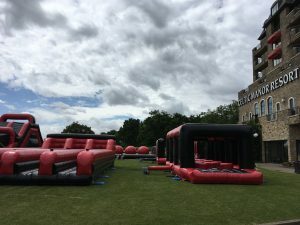 24 hours later we had put on our scruffs and in a race against the clock were throwing ourselves into a giant inflatable ‘It’s a Knockout’ challenge. 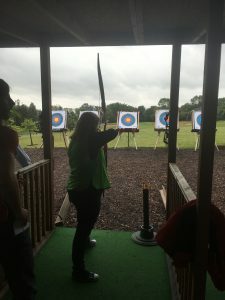 We were dodging flying pigs and Donald Trump during the making of our fake news videos and did our best not to spear our teammates with the archery arrows, harder than it looks! 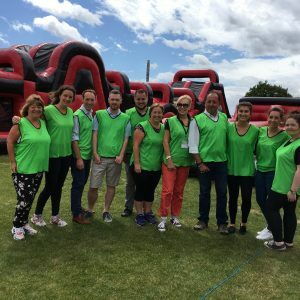 The imminent rain was not going to deter us and Philippa’s green team still managed a respectable score in the wind and rain on clay pigeon shooting while Katy’s blue team were moved inside to do the ‘It’s a Knockout’. All this fun and still networking with over 40 different new contacts.